Global Warming 101 – Part 2 of 5 | Fresh Air. The Scent of Pine. Continuing our discussion of global warming and climate change, we’ll focus in this section on the human impact on our global surroundings. Previously, we’ve noted the importance of the Earth’s greenhouse effect and how this effect is driven by less than 1% of the gases in Earth’s incredibly thin atmosphere. We discussed that water vapor, while being a powerful greenhouse gas, only remains in the atmosphere for a period of a few days, preventing It from driving long term changes in the greenhouse effect on its own. Carbon dioxide, on the other hand, while a relatively weak greenhouse gas, can accumulate in the atmosphere due to its very long atmospheric lifetime, enabling its impact to be both global and long term. But what role is being played by human activities? Figure 2-1: The Bagger 288 is used to mine for coal. One of the characteristics that separates us from other species is the ability to utilize complex tools to perform work. And there are few machines more impressive than the one shown in Figure 2-1. The machine on display is the Bagger 288. It’s length is ½ the height of the Empire State Building, and it can dig a hole the size of a football field to a depth of 98 feet in a single day. In 2008, there were 852 surface coal mines in the United States alone. 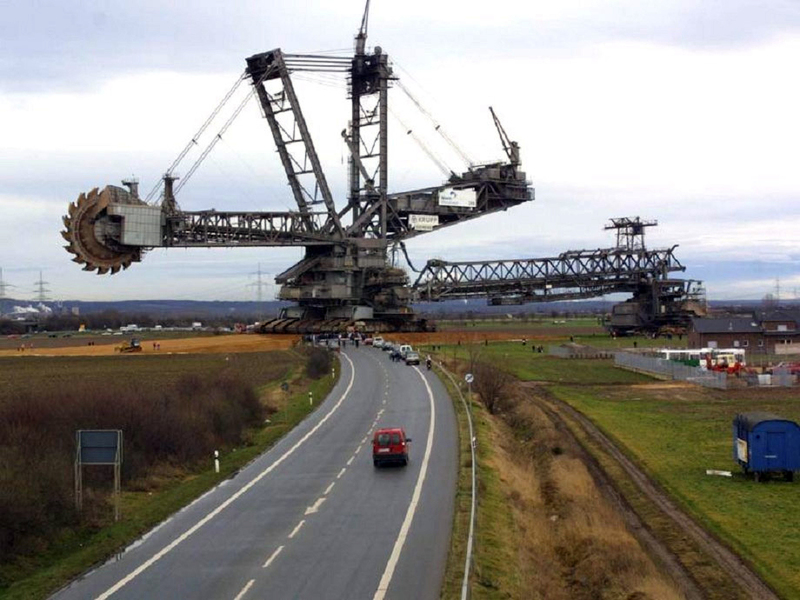 The purpose of the Bagger 288? To dig open pit coal mines. Through the use of such machines, we can completely alter our surrounding environments. 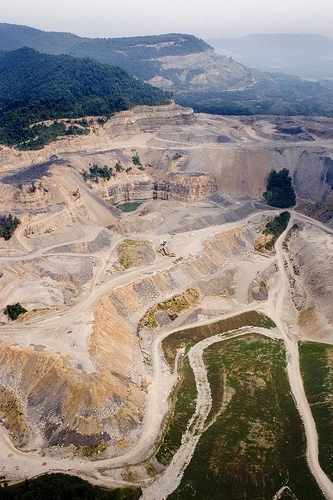 We can level entire mountains in a process called mountaintop removal coal mining, and we can take thousands of acres of dense rainforest that took hundreds of years to grow, strip it bare, and replace it with villages and fields over the course of only a few years. And we repeat such large scale alterations around the world. But let’s take a step back even further. Figure 2-2 shows the Earth at night, revealing the lights of human civilization. Despite being from space, it’s very easy to pick out the areas of greatest population density and industrialization. Few images so clearly demonstrate the ability of our one species to change the face of our entire planet. But what effect do we have? Very few people go out with the specific purpose of destroying their natural surroundings. More often than not, our intents are respectable. We seek to build homes in which to live, grow food for our sustenance, and provide means to make a financial living. And these actions are generally done with regard given to the local environment. But oftentimes it is difficult to predict and ascertain the long-term and widespread impacts of our actions, and, as a result, we encounter some very unintended consequences. Pictured in Figure 2-3 is what’s called an oceanic “dead zone”. 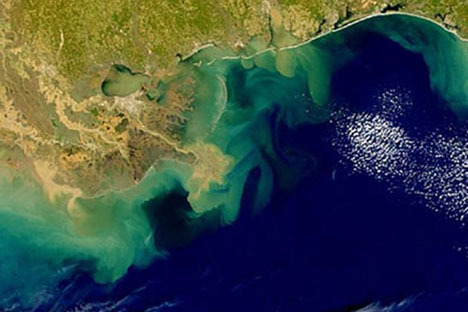 This particular dead zone covers thousands of square miles off the coast of Louisiana in the Gulf of Mexico. Found near the mouths of rivers around the world, dead zones are created when fertilizer from upstream crops accumulates and reaches the ocean, leading to an overgrowth of oceanic phytoplankton, seen in the light green coloring in the picture. As a result, there can be little to no dissolved oxygen in the water within these dead zones. Animals that cannot escape the impacted area, such as shrimp, crab, lobsters, and so on, die as a result, giving the “dead zones” their name. And many of these dead zones are growing larger and larger each year. Though well intended, our actions can also alter the impact of forest fires. When a forest fire starts, the first and natural reaction is a desire to suppress and extinguish it as quickly as possible. However, fires serve a very vital purpose in the natural processes of the forests. Rapid extinguishment of fires can lead to an overgrowth of underbrush. And, when such an overgrowth exists, it can result in new fires becoming much more intense and difficult to contain, resulting in much greater damage. To avoid this, many localities, particularly with forests near heavily populated areas, have adopted the practice of having what are called “controlled or prescribed burns” where the underbrush alone is burned periodically in a very controlled way. This process seeks to lower the intensity and aid the containment of any natural or accidental fires which occur. And while the long-term influence of a warming climate on hurricanes is still a subject of much debate, our actions are already modifying the impact such weather events have when they do occur. Few other natural occurrences in recent years have had the impact of Hurricane Katrina, which made landfall as a strong Category 3 storm back in 2005. But the impact of what would have been a very destructive storm under any circumstances was inadvertently made considerably worse. Development along oceanic coastlines can result in the destruction and elimination of natural wetland areas and barrier islands, natural impediments which help dissipate the strength of storm surges. Along the Louisiana coast, such wetlands are being lost at a rate of 40 square miles a year and have been for decades. When Hurricane Katrina struck, it brought with it more than a 20 foot wall of water that surged miles inland along the Louisiana, Mississippi, and Alabama coastline, destroying much of everything in its path. Landslides can also be impacted. 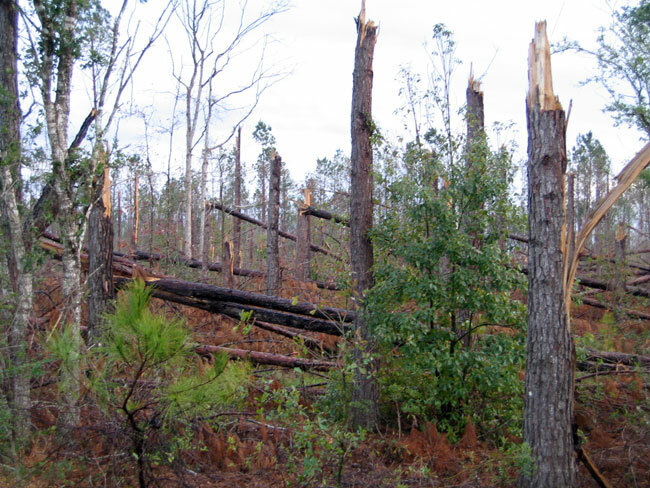 Human activities related to deforestation, development, and crop irrigation can remove stability-providing root and tree structures and modify water penetration into natural earth formations. These changes can greatly influence the stability of these environments, resulting in sudden, violent, and devastating slides of tons of soil, rock, and debris at speeds of up to 200 mph. 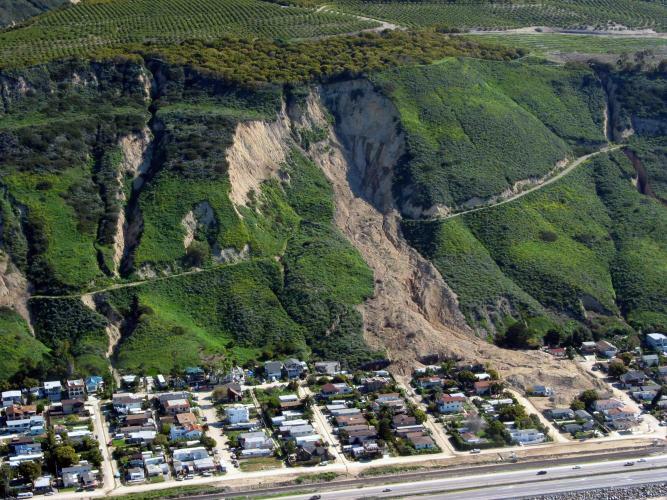 The landslide shown in Figure 2-5, from January 2005 in La Conchita, California, released 250,000 cubic yards of earthen material, destroyed or damaged 36 homes, and killed 10 people. A lawsuit brought by those impacted found the ranch located at the top of the hillside, where lemons and avocados were grown, partly to blame, due to improper drainage of the ranch’s irrigation system. Looking at our global impact, the atmospheric level of carbon dioxide has increased 39% in 130 years of the industrial period, despite large-scale natural opposition. This rapid rise of CO2 is unprecedented in the geologic record of the planet, and the current levels of CO2 are higher now than they have been in the last 650,000 years and likely the last several million years. Human activities have literally driven the atmosphere into uncharted territory, pushing the primary long-term greenhouse gas to a level it has not seen in hundreds of thousands of years and at a rate the planet has likely never seen. And this fundamental change to our atmosphere is having its own unintended consequences around the world. So, in this section, we’ve noted that humans, as a species, are unprecedented in the 4.5 billion year history of the planet. Never before has a species been able to consciously alter its surroundings on such an immense scale. However, our history is replete with examples that these actions are often accompanied by severe, unintended, and difficult to predict consequences. Now human activity has pushed the atmospheric concentration of carbon dioxide to a level it has not seen in hundreds of thousands, if not millions, of years and at a rate that is unprecedented in the geologic record. At this point we’ve established that Earth’s climate is dependent on the greenhouse effect, that the greenhouse effect is dependent on carbon dioxide, and that our industrial activities have rapidly increased the atmospheric concentration of carbon dioxide in an extremely short period of time. But exactly how is the climate reacting to such changes? That will be the subject of our next section.